Last night we got our Christmas tree! The house is a wreck, as we just got home from traveling to see family for Thanksgiving, but in the midst of laundry and bags and piles, we pulled the tubs of Christmas decorations out of the attic and made a family outing to pick out a tree. 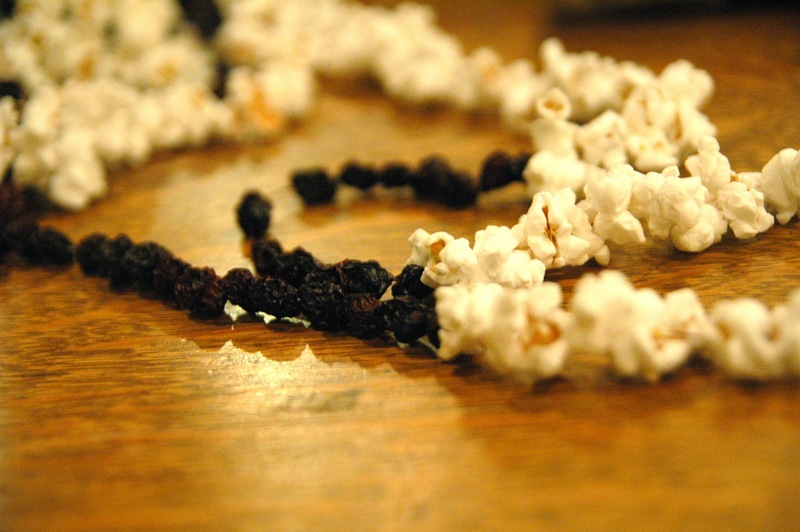 I love this tradition and it gets more fun every year. When decorating the tree I always think back to the first year I was married. We lived in a condo, I was in grad school, and we were working many jobs to make ends meet. It was December and we were trying to decide whether or not we should buy a Christmas tree. Being the practical one, I suggested we not and save the $25 for a necessity, while Dave being the more adventurous one really felt like we should have a tree for our first Christmas. I was geared up to string lights and candy canes on our little ficus tree in the living room, but was thrilled when we made the decision to get a real Christmas tree. It was a little tree, humble Charlie Brown-like in many ways, but it was OUR tree. We didn’t have any ornaments and we had no “extra” money so we decided to make-do. 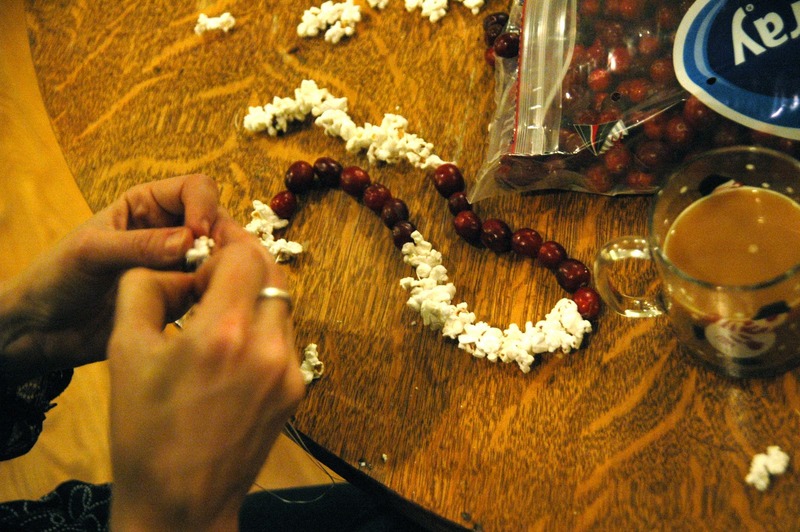 We threaded cranberry and popcorn garlands and baked salt dough ornaments of various shapes. We bought candy canes to hang on the tree. It was a sweet and lovely tree. We had neighbors upstairs who were also newly weds, however they were far more sophisticated and financially stable than we were. She popped her head in the door as we were finishing the tree and said, “Oh that is so sweet, I love your tree! We just got ours this weekend too.” I asked if I could come up and see hers. Walking into the living room, I was stunned by the giant tree that was bending its top at the ceiling. It was laden with shiny blue and silver balls, sparkely ornaments, tinsel and glitz. I commented on how glamorous the tree was, to which she replied that she had purchased all the decorations at Pier 1. And while hers was spectacular, she liked mine better! Mine had “heart and thoughtfulness”, she said. I came back down and looked at our simple, homespun tree and agreed whole heartedly. Well, the same Christmas tree theme remains 15 years later, but with the addition of a couple of boxes of children’s ornaments. Some handmade by the kids, some given as gifts and some part of the collection that I began when my first child was born. Each year I buy them an annual ornament, on which I inscribe their initials and that year. Every year they are anxious to find “their” special ornaments and the corresponding one(s) of their siblings from years past. Last night I was telling Asher about the ornament with the snow-mommy holding her snow-baby that my friend Carrie had given me at Asher’s first Christmas. 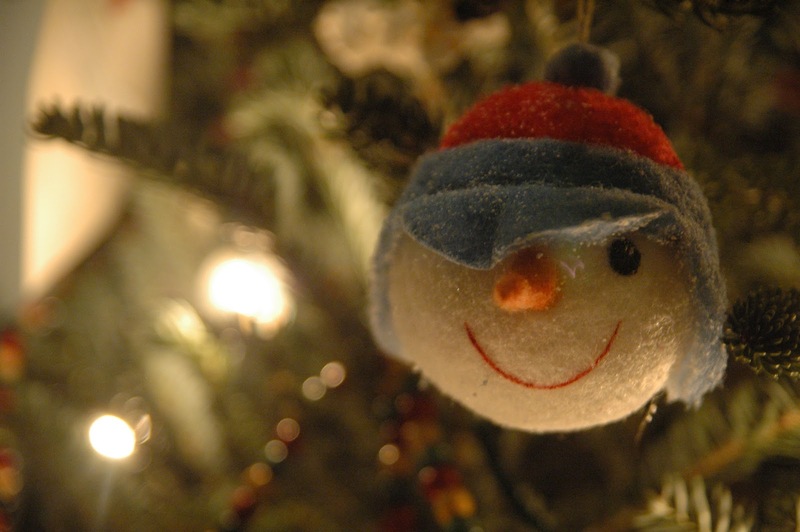 He remarked, “Ornaments really help us remember things don’t they?” They sure do. 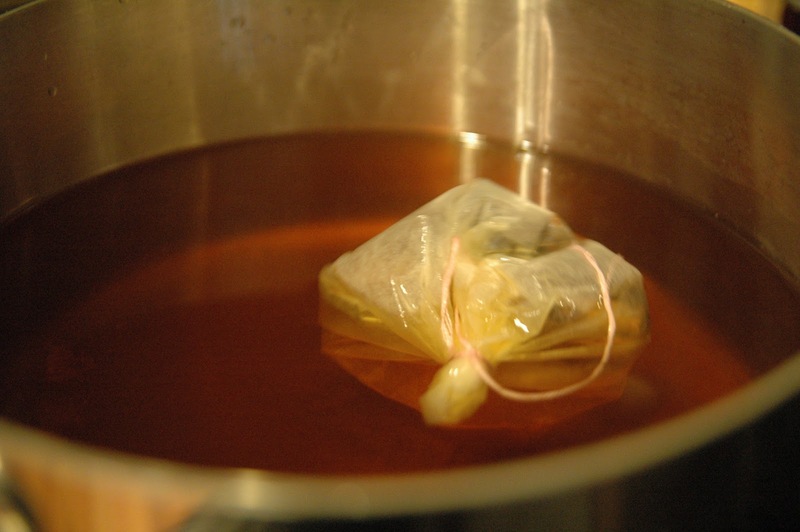 Warm some Mulled Cider on the stove top– so easy and yummy and makes the house smell cinnamon-y. Asher specifically requested Cider this year. I love requests. Combine brown sugar, salt, and cider in a pot on the stove. 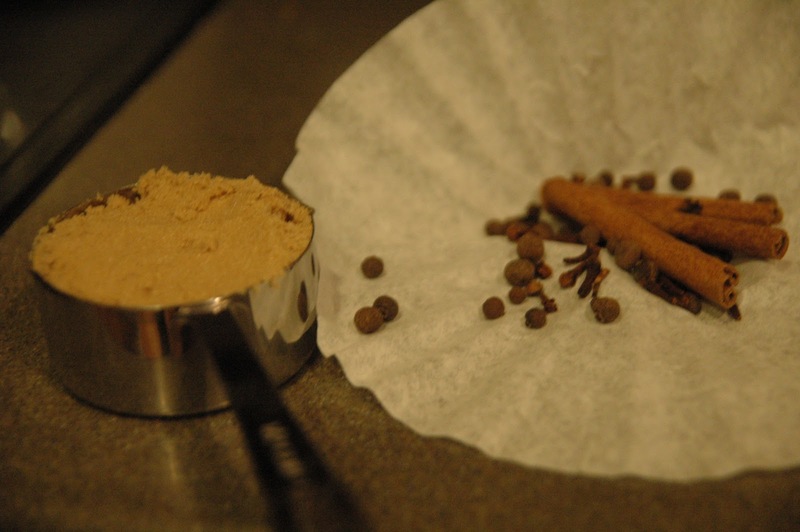 Tie spices in small piece of cheesecloth (or a coffee filter if you don’t have cheesecloth); add to the pot. Slowly bring to a boil; simmer, covered, 20 minutes. Remove spices. Serve hot. 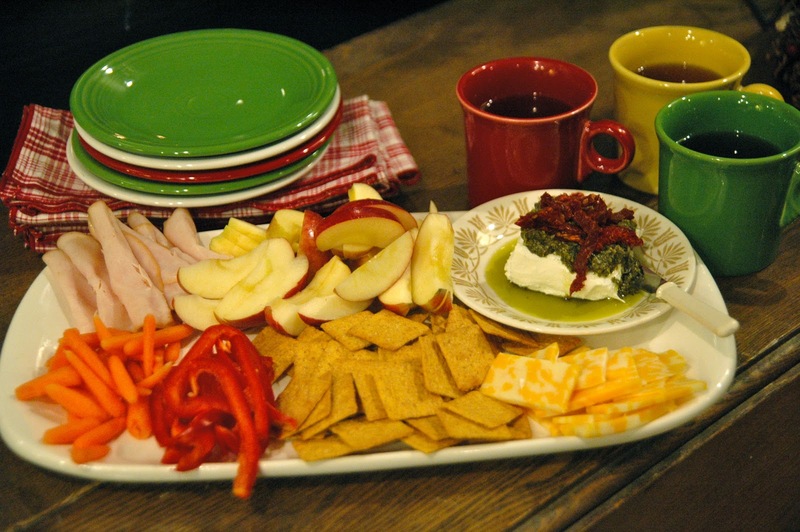 Have a snacky meal- I took ½ a block of light Cream Cheese and topped it with a few spoons-full of bought/jarred pesto and a handful of sun-dried tomatoes served with Wheat Thins for our “main dish” and Colby/Jack cheese slices for the kids, raw veggies, apple slices and some deli turkey slices. 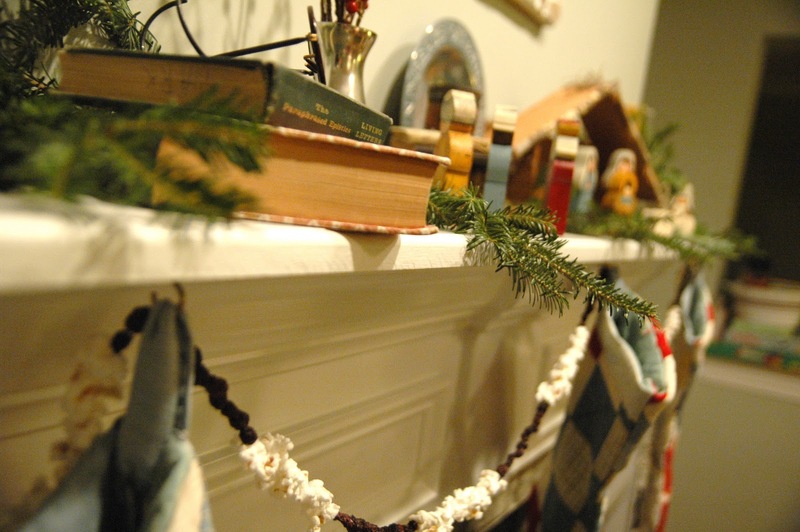 Easy, quick, pick up as you decorate, done. All food groups represented. 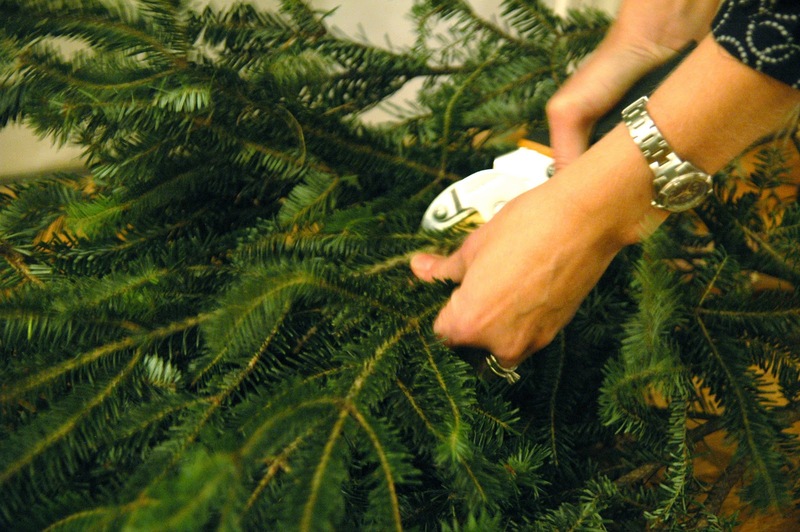 Use free greenery to deck the halls- If you have bushes: holly, magnolia, boxwood, etc. you have a resource in your own yard! Get those clippers and grab some springs that you can stuff as décor and greenery all over your house. If you don’t have that resource, like I don’t, then take advantage of the pile of free “trimmings” at the Home Depot, or other tree retailer. They give away the trimmings and I always grab a bunch, use some and keep the others outside in the cool until I need to spruce things up in a couple of weeks. I hope this season of Advent and Christmas is a joyous and meaningful time for you! I love seeing and hearing about your Christmas tree traditions. I have a sweet memory of going to get a live tree for Daniel's first Christmas (15 years ago!) and we always have a hodge-podge of memory ornaments on our tree, too. Merry Christmas to your family! Merry Christmas to you, Nanette!